Alena Naron (a.k.a. Mrs. Joy and Happiness) will motivate you with wit and wisdom and help you build your dreams for the future. With over a hundred hours of video coaching and encouragement, Alena Naron has dedicated her life to helping you grow and succeed. I am just an ordinary woman turned extraordinary through circumstances. "More Life-Changing Coaching from Alena Naron"
"Receive Life-Coaching from Alena Naron"
The focus is entirely on you! One-on-one coaching that will nurture and renew your spirit, and guide you to deep personal insights, choices and decisions about your life. 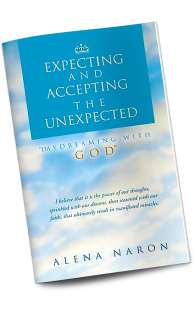 In "Expecting and Accepting The Unexpected: Daydreaming with God", Alena Naron teaches a new approach to manifest personal desires, change, and satisfaction through a series of practical empowerment thoughts and actions.